Rent an Apartment in Bucharest, Romania with EastComfort. 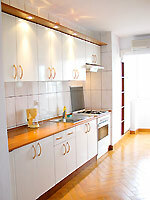 Our agency manages over 50 quality apartments for rent in Bucharest. Select an apartment in Bucharest by price, the number of guests or by our recommendations. 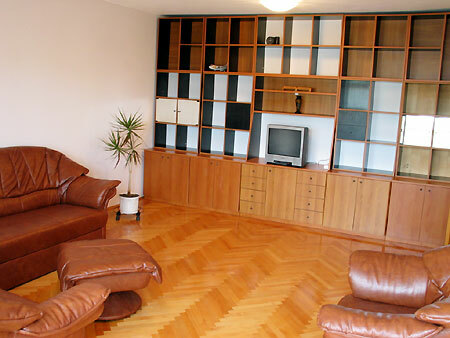 This apartment in Bucharest is the right solution if you need a fully furnished and equipped home for short term. The flat consists of a large living room, fully fitted to suit business meetings (cozy furniture, a bookcase, TV set, air conditioning). Furnished with a leather extensible sofa and two armchairs, the sitting-room can turn into an intimate place. The bedroom has a double bed, wooden carved, large windows, full sized wardrobe, fancy night tables and lamps, all of these assuring your restful hours. Thus 4 persons could be accommodated in this apartment. The kitchen is fitted for all your cooking needs (gas-cooker, fridge, ustensils, glasses, plates). 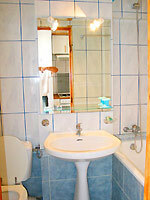 The blue-white bathroom, endowed with bathtub and shower attachment, continues the same line of comfort. Well-situated in one great demand area of Bucharest, namely in Unirii Squre, this flat offer you both accomodation with a lot of intimacy, but also great surroundings (a wide variety of entertainment, touristic sight-seeings and financial or commercial quarters).